The Location Field is used to show GPS information based on the location of the device. It is done automatically by Geolocation. Always ensure that location services is turned on, on your device. 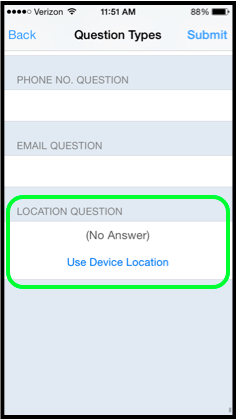 When you click on a location map value in the mobile form, additional options are shown. You'll notice that the question states how far away the pin is from your current location. The option to toggle between miles and kilometers for this measurement can be found by clicking the information icon in the top right corner. The option to toggle between "Map" and "Satellite" views for the map is also present. By clicking "Get Directions", the Maps app will open and the directions to the dropped pin will populate. Additional options not mentioned above. Slider - Adjust the opacity of the image overlaying the map. Off button - Don't show the image overlaying the map. Select a map overlay resource. 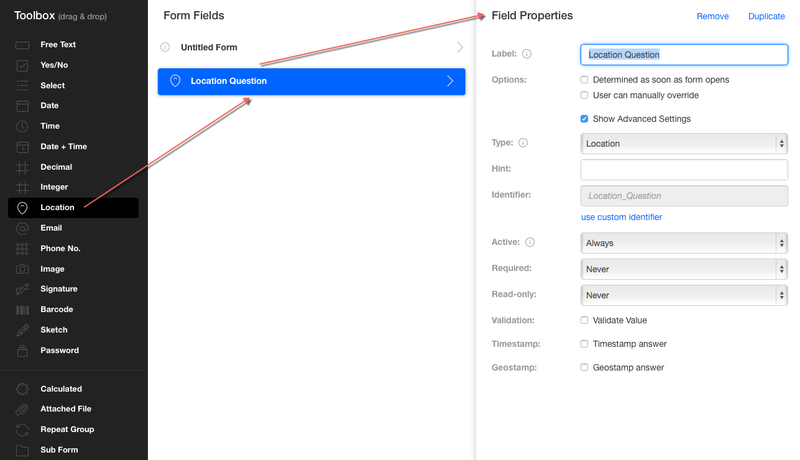 Check this option so the location of the device is recorded the moment one opens the form.